After the failure of the campaign against the Union forces in the Cheat Mountain area in September 1861, the Confederate troops withdrew to the Greenbrier River, under the command of Gen. Henry R. Jackson. During the night of October 2–3, Brig. Gen. Joseph Reynolds, with two Union brigades, marched twelve miles from Cheat Mountain down the Staunton-Parkersburg Turnpike to break up the Confederate position at Camp Bartow. 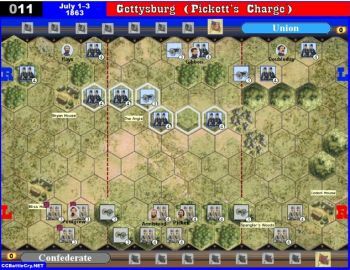 At daylight, the head of the Union column was about four miles from the Confederate camp, and fought a lively skirmish with Confederate pickets posted there. The pickets retreated back to the fortified position. 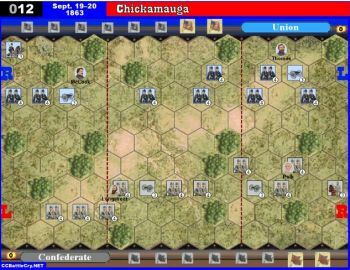 Jackson had skillfully positioned his men along the mile-long line. Col. Edward Johnson's temporary brigade was placed on the extreme right, Col. William B. Taliaferro's brigade held the center, while Col. Albert Rust's brigade was placed on the left flank. 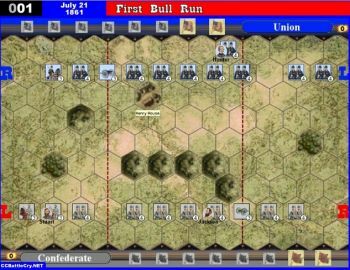 Reynolds ordered the Union artillery forward and an artillery duel lasted nearly an hour. 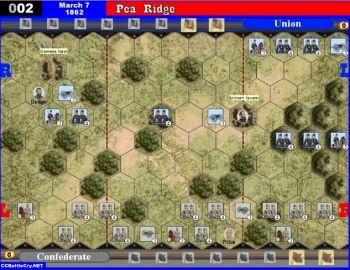 Each Confederate brigade then repelled wave after wave of attacking Union troops with rifle fire. 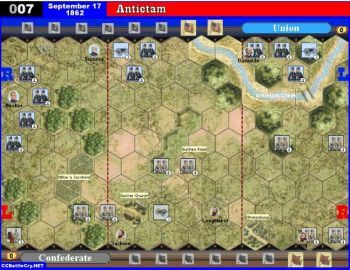 After four and a half hours of fighting, and repeated attempts to turn both of the Confederate flanks, Reynolds abruptly broke off the engagement and ordered a return to the Cheat Summit fortification. 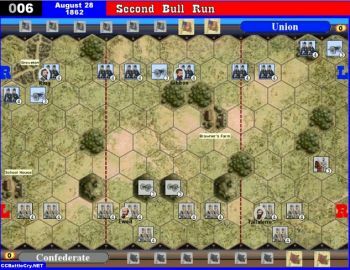 • At the start of the Union turn, if a Union unit occupies any fieldwork hex, it counts as one Union victory flag. 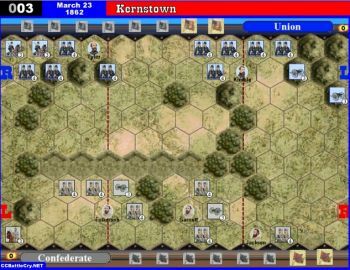 Place the flag token on Union victory stand. 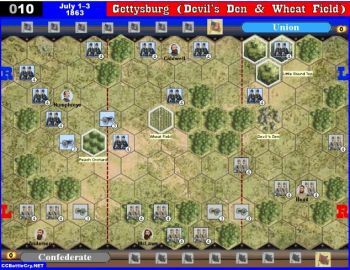 As long as the Union unit occupies the hex, it continues to count toward the Union victory. If the unit moves off or is eliminated, remove the flag token from the victory stand. 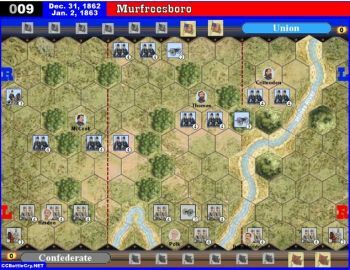 • The 4 Union infantry units indicated on the map are “green” units. 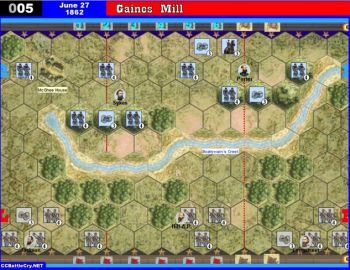 Green units must retreat 2 hexes when forced to retreat. Place a flag on these 4 infantry units to distinguish them from other infantry units. 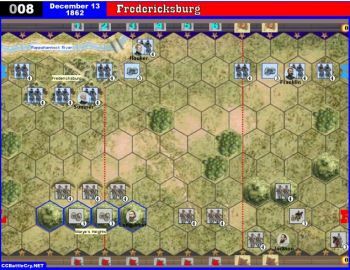 Do green units in the battles of Greenbrier River, Belmont and Richmond Kentucky retreat 2 hexes PER FLAG? 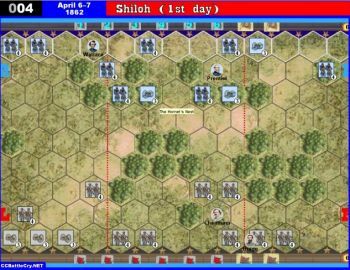 Green units must retreat 2 hexes for each flag rolled against the unit when forced to retreat.